Meet Nina and her Family! In a matter of days, we realized we were not alone, and it wasn't as scary as we thought, though I think most would agree that medical issues with children are still about as scary as it gets. Down syndrome is not just about intelligence, it’s about health and development. Many children with Down syndrome need open heart surgery as babies- Nina didn't. We were so fortunate. After Nina was born, my perspective changed about many things: biology, statistics, humanity, compassion, healthcare, community, human rights, education and inclusion, to name a few. I had never given more than a passing thought to what having disability would be like- whether intellectual, or physical, or at birth, or after an accident, or something that is just a nuisance every day- then I noticed it everywhere! Fast forward to today…Nina will be 9 years old this November, she's in 3rd grade in our local school her brother went to, she loves horseback riding and swimming (but does both with special instruction), and she loves traveling and eating great food - even though she can't have gluten due to celiac disease which is common. Her health is what is most important and she only has minor health concerns we watch and monitor. She's so funny, and cute, and lights up our life, and drives her brother nuts sometimes- as it should be. I love being her mom, and I just remind myself when things take a lot of patience or seem tough that all moms (and dads) go through similar with their kids. And that it does take a village, especially when you need a little extra support. Do people look at us twice and sometimes whisper to each other or ask question about why she acts differently than they expected her to? They sure do, but that's ok. Kids ask the most, they are curious and direct, and they just want to understand. One day when someone is not nice, whether and adult or a kid, we will try to explain to them that while some people need different or extra support they can still be your friend, live meaningful lives, and do meaningful work. People who have Down syndrome are breaking through into mainstream media which is a great way for people to learn more about how much they can do, and how inspiring they can be. A&E is set to run the 4th season of a show called "Born This Way." The cast of adults who have Down syndrome and their parents just won an Emmy! It's really cool to see how the adults on the show grow and learn and go out into the world to get job training and work, and get paid - hopefully fair pay! I am looking forward to even more possibilities and openness when Nina is ready to work. 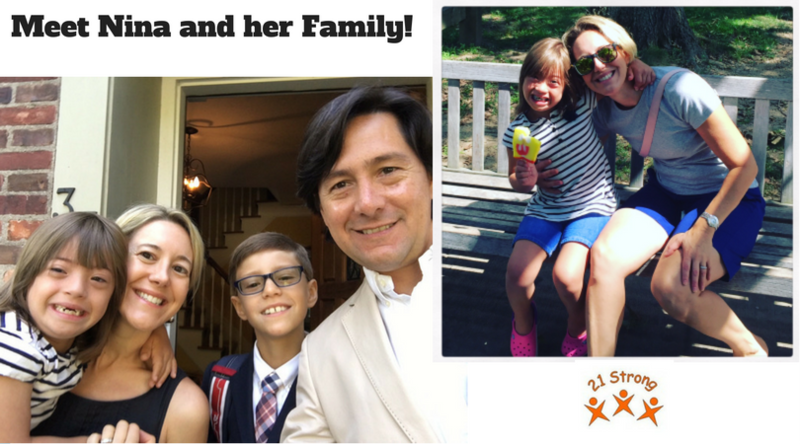 I have been a part of 21 Strong since 2009 – and am glad to keep in touch with the families I have met over the years.